23 June/July 2018 unmanned systems inside P P IP Integration Pilot Program Team Profi les "ADDING MORE (TEAMS) AS PART OF THE (IPP) PROGRAM…THAT WILL BE REALLY BASED ON RESOURCES AND WE ARE CONCERNED—NOT THAT WE WON'T SUCCEED BUT (THAT) WE DON'T KNOW HOW MUCH TOTAL RESOURCES IT'S GOING TO TAKE JUST TO WORK WITH THE 10 WE HAVE NOW." Earl Lawrence, executive director of FAA's UAS Integration Offi ce ing its planes and for bringing small parts from the warehouse to airplane mechanics using a pre-established f light corridor. 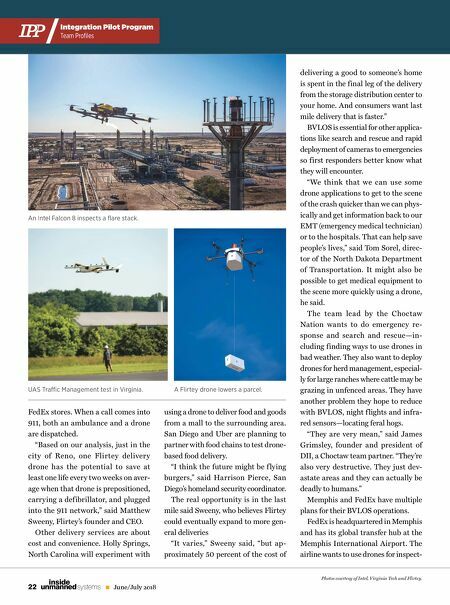 "The drone is f lying above the traf- fic and obstructions so it can move much faster than a mechanic who has to drive back to the warehouse," said Scott Brockman president and CEO of the Memphis-Shelby County Airport Authority. 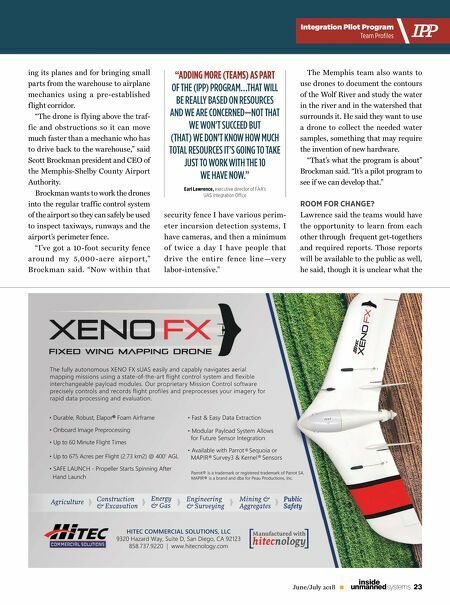 Brockman wants to work the drones into the regular traffic control system of the airport so they can safely be used to inspect taxiways, runways and the airport's perimeter fence. "I've got a 10-foot security fence a r ou nd my 5,000 -a c re a i r p or t ," Brockman said. "Now w ithin that security fence I have various perim- eter incursion detection systems, I have cameras, and then a minimum of t w ice a day I have people that d r ive t he ent ire fence line—ver y labor-intensive." The Memphis team also wants to use drones to document the contours of the Wolf River and study the water in the river and in the watershed that surrounds it. He said they want to use a drone to collect the needed water samples, something that may require the invention of new hardware. "That's what the program is about" Brockman said. "It's a pilot program to see if we can develop that." ROOM FOR CHANGE? Lawrence said the teams would have the opportunity to learn from each other through frequent get-togethers and required reports. Those reports will be available to the public as well, he said, though it is unclear what the HITEC COMMERCIAL SOLUTIONS, LLC 9320 Hazard Way, Suite D, San Diego, CA 92123 858.737.9220 | www.hitecnology.com Agriculture Construction & Excavation Energy & Gas Engineering & Surveying Mining & Aggregates Public Safety Parrot® is a trademark or registered trademark of Parrot SA. MAPIR® is a brand and dba for Peau Productions, Inc. • Fast & Easy Data Extraction • Modular Payload System Allows for Future Sensor Integration • Available with Parrot Sequoia or MAPIR Survey3 & Kernel Sensors ® ® ® • Durable, Robust, Elapor Foam Airframe • Onboard Image Preprocessing • Up to 60 Minute Flight Times • Up to 675 Acres per Flight (2.73 km2) @ 400' AGL • SAFE LAUNCH - Propeller Starts Spinning After Hand Launch ® The fully autonomous XENO FX sUAS easily and capably navigates aerial mapping missions using a state-of-the-art flight control system and flexible interchangeable payload modules. Our proprietary Mission Control software precisely controls and records flight profiles and preprocesses your imagery for rapid data processing and evaluation.